On 28 January 2015 Lucia Pierro and Marco Scarpinato of AutonomeForme, Italian winner of the Holcim Awards, are the guests at the Salon of Honor in La Triennale di Milano during the event titled “Faccia a faccia con i vincitori italiani” (Face to face with the Italian winners) organized by the Holcim Foundation to talk about sustainable architecture.The event was opened by Kaspar E.A. Wenger, Holcim Area Manager Central Europe and the CEO Holcim (Italy). Following intervenes Edward Schwarz, General Manager of the Holcim Foundation for Sustainable Construction. 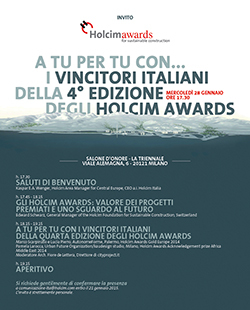 The central part of the event at the Grand Salon of La Triennale di Milano is dedicated to Italian winners of the fourth edition of the Holcim Awards for Sustainable Construction. Speakers Marco Scarpinato and Lucia Pierro of AutonomeForme, Palermo with the moderation of Fiore De Letter, Director of Cityproject.it.